It is important to test the profit potential of a particular CPS affiliate program before you invest a significant amount of time and money into promoting it. Knowing why and how you should test your CPS affiliate offers will help you boost your conversion rates in both the short and the long term. 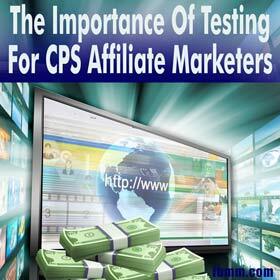 Why Should You Test as a CPS Affiliate Marketer? Extensively promoting a product that claims to have a high conversion without testing it first can lead to disaster. First do your research; this will give you valuable insights into the product, which can help make your promotions more effective. Learning what ads get attention, what traffic leads to conversions and simply how to spend your money to earn the highest return can make the difference between earning a healthy profit with this product and losing your shirt. Under a CPS system, you only get paid for the traffic you generate for a business that actually leads to sales; the total traffic, including all the individuals that buy nothing, is irrelevant as far as your income is concerned. Since generating sales is quite a bit more difficult than merely generating traffic, businesses will typically pay much more to a quality CPS affiliate than they will to other types of affiliates. Basically, your job as a CPS marketer is to focus on quality leads rather than quantity. The answer is simply to get very, very good at testing and research. When doing your research, your goal is to answer these questions as thoroughly as possible. What is the saturation of its niche? What is the total price of the product, as well as your commission versus the conversion rate per month? What is the projected long-term life of this product and its niche? Is this product or its niche dependent on the economic climate of its chosen demographic? How many hours will you have to spend to promote it upfront and long-term compared to how much income it will generate monthly and annually? Put in simpler terms, how much per hour will you make off your promotional efforts for this product? How much is the total start-up cost, including trying the product yourself if necessary? Do you get paid commission on affiliates who sign up under you for their sales? 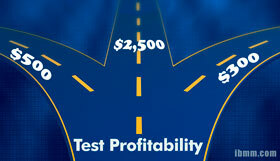 What is the Effect of Calculating Cost per Sale Affiliate Income? Finally, you need to calculate the commission rate before testing and then promoting a product. Suppose that you have three companies to choose from: A, B and C. Most would assume that the one with the highest commission rate is the best choice, but this may not necessarily be the case. Merchant A converts five percent of its visitors. Out of 1,000 visitors, 50 will purchase, netting you $500. Merchant B converts one percent of its visitors. Out of 1,000 visitors, only 10 will purchase, earning you $300. Merchant C sells products at $500 or more apiece, with a conversation rate of 0.5 percent. Out of 1,000 visitors, only five will purchase, but that could earn you $2,500 or more. When looking at conversion rates, you should also check out the market history for that product. Are sales increasing or decreasing? Is this a product with repeat sales, or one that will likely lead to future sales (such as a consumable product)? Consider the survivability of the market and if an upturn in the economy will decrease or increase sales and vice versa.